This last ten days of fishing has been fair to good. I have fished the last five days in a row, with both morning and afternoon trips. We had real good results on some days and had to work really hard to catch a few fish the others which is typical for this time of the year. The current lake level is at 614.51 with a water temperature of 49 degrees. With warmer weather this past week, it has been beautiful out on Lake Texoma. Using live bait we are still fishing west of Highport Marina in 40-50 feet water. The stripers are stacked like cord wood in the river channel but I have not had any luck enticing them into taking the bait. All the fish I've caught have come off the ledges and creek channels. As the weather continues to warm up and With Spring Break starting up, we'll be fishing daily and should see things really starting heating up. If you have the time head out to the Lake and enjoy the fishing and beautiful sights. 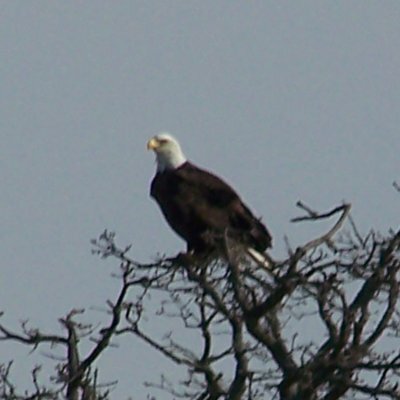 We saw this beautiful Bald Eagle on a point out of Big Mineral this week. As spring hits we are seeing a lot more boats out on the water so be careful and always paying attention to what is going on around you. Be courteous to your fellow fishermen, show a little patience at the ramp, remember its been awhile. 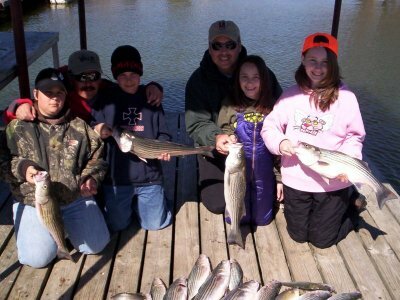 Lastly don't forget to get your Lake Texoma Fishing License. Be safe and have a fun day on beautiful Lake Texoma.